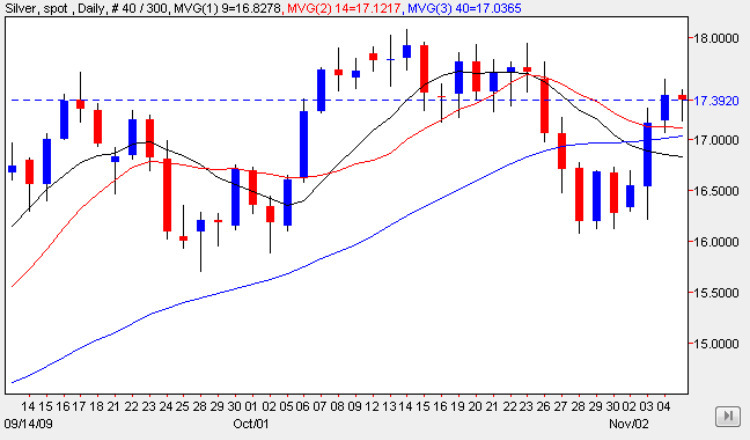 Silver spot prices paused yesterday following the strong gains of the last two days, and ended the silver trading session marginally lower but with a deep lower shadow to the lower body of the candle, and with the low of the day finding some support from the moving averages below which are now tightly bunched. Unlike spot gold, silver is battling its way through a deep and persistent area of price congestion, and until we clear the top level, there remains the danger that this could prove to be an impenetrable barrier for a further move higher, with $18 per ounce being the first target that needs to be breached. With potential support below and possible resistance above, as I have outlined before, we are in a very tricky area technically on the daily silver chart, and until one of the levels is broken with a significant move we cannot be certain of the longer term direction for spot silver prices. Longer term the outlook remains bullish a view supported by the gold chart, but in the short term we may see a further period of consolidation at this level, before finally seeing the long awaited break higher in due course.